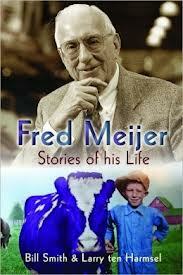 Fred Meijer, Stories of His Life — Retailing pioneer Fred Meijer comes alive in the pages of this intimate biography, told in part by the people in Fred’s life — from store cashiers to American presidents. Astute businessman, visionary arts patron, homespun philosopher — Fred is a man of many parts. His story weaves a chronicle of how to succeed in business, how to shape one’s life, how to leave the world a better place, and how to have fun along the way.